Twelve centimetres shorter than the T-Roc, the T-Cross is still a fully fledged 4-door. What is it? Despite its diminutive proportions, it seems the new Volkswagen T-Cross is a small car with big ideas. The clue to the size of its ambitions lies in its motto, “I am more”. 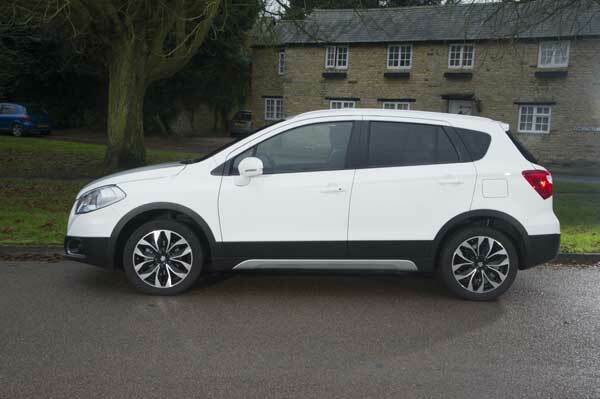 The T-Cross is not just another small SUV in a crowded market – it’s a small car that means business. Is it a looker? With a broad bonnet and dominant grille, it is undeniably chic, not overly muscular or aggressive. 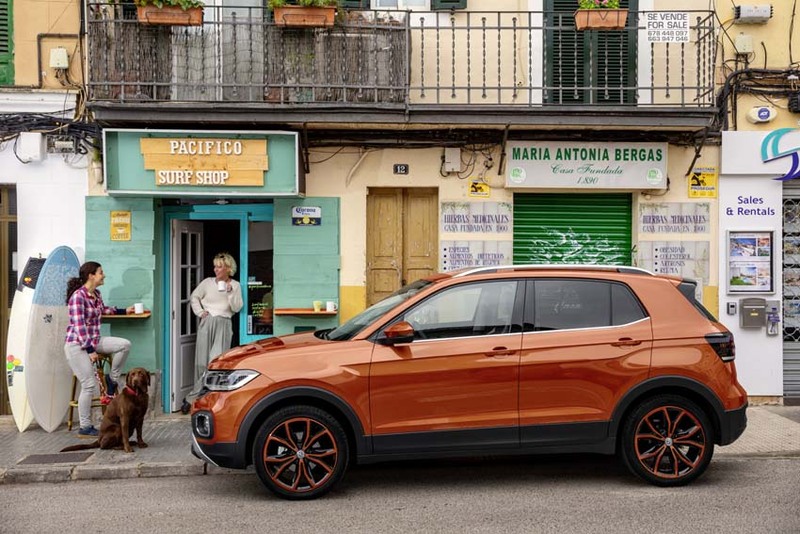 Aimed squarely at a younger audience, it is available in a range of colours including ‘Reef Blue’, ‘Makena Turquoise’ and ‘Energetic Orange’, but even on a dull day in Mallorca our grey T-Cross managed to draw a covetous glance or two. What about the interior? Once tempted inside, the T-Cross is surprisingly roomy and feels substantially bigger than the Polo I had parked at the airport in Dublin. It’s hard not to be impressed with the head and leg room or the pleasure of that lofty driving position in such a small car. The layout is simple and uncluttered with durable materials, while the brightly coloured panels are intended to appeal to the twentysomething motorist. It is roomy enough for a family of four and the sliding rear-seat bench means you can create up to 1,281 litres of storage space. Enough to accommodate wakeboards or ski bags as Volkswagen suggests. In terms of size, it is 4.11m long and 1.58m high so it is fractionally bigger than the Polo and a mere 12cm shorter than the T-Roc. Under the bonnet? There will be three engines from launch; a 1.0-litre petrol with two versions, one with 95hp (112g/km) and five-speed transmission and a 115hp (111g/km) version with six-speed transmission or the option of a 7-speed DSG. A new 1.6-litre 95hp diesel will also be offered. And on the road? On the road it’s fun, light and agile and sharper round corners than rivals. The 115hp TSI proved particularly impressive with oodles of oomph. Will it break the bank? On sale here next month, three trims are available and prices start from €22,495 for the entry level T-Cross, followed by the ‘Life’ priced at €24,550, ‘Style’ at €26,795, and ‘R-Line’ from €27,995. The ‘Life’ model includes 16″ alloy wheels, 8″ infotainment system, App Connect, Climatronic Air Conditioning, two USB interfaces and Adaptive Cruise Control. Trade up to the ‘Style’ model for extras such as 17″ alloy wheels, LED headlights, and a Chrome package, while the ‘R-Line’ model adds 17″ Sebring wheels and an R-Line interior package. What about safety? The T-Cross also comes bursting with safety features, many previously only found on much pricier cars, including a front assist area monitoring system with pedestrian monitoring, city emergency brake and a proactive occupant protection system, which closes the windows, tightens the seat belts and applies additional brake pressure in a potential accident situation. Why you will like it? Despite their popularity, it is hard not to wonder what exactly is the point of a small crossover? Would you buy one instead of a Polo with the same engine and keep a few more euro in your pocket? By combining a roomy family car with striking good looks, Volkswagen’s T-Cross delivers on the promise of more – more space than rivals and crucially more attitude than a jacked-up small hatchback. For more information on the T-Cross visit the Volkswagen Ireland website or its Facebook page for further details.